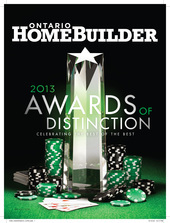 Reid’s Heritage Homes of Cambridge, a forward-thinking home builder with a philosophy built around customer service and a dynamic workplace culture, was named 2013 Ontario Home Builder of the Year at the 50th Ontario Home Builders’ Association Annual Conference. Reid’s edged out Tridel and defending champ Minto, both of whom were finalists for the prestigious honour. The award is presented annually to the new-home-building company that demonstrates the highest levels of performance, creativity and ingenuity based on judging criteria in the areas of sales and marketing excellence, floor plan design, community service, support of the industry and its ability to adapt to changing needs. “This award is special because it comes from our peers. It means a lot to every member of our team,” says Blake Seeberger, senior vice-president of residential construction for Reid’s Heritage Homes. Founded in the 1970s but tracing its roots back to 1947 and builder Orin Reid, whose sons and son-in-law now work for the company, Reid’s has built single detached homes, mid-rise condos, two-storey townhomes as well as custom estates and active adult communities in Guelph, Cambridge and Waterloo Region, as well as Kincardine, Port Elgin, Thornbury and the Georgian Bay area. Based in Puslinch Township near Guelph, Reid’s constructed the first LEED (and LEED Platinum) home in Canada, as well as the first Built Green home in Ontario. Over the next five years, the company will be among five selected home builders participating in a national Net-Zero Energy home building project with National Resources Canada and Owens Corning. Evidence of Reid’s environmental commitment was reflected in the company’s February 2013 launch of the LiveWise program, which emphasizes top quality, satisfied customers, environmental responsibility, superior service, exceptional design and the creation of vibrant neighbourhoods. The company received further validation in June, when it was presented with the 2013 City of Guelph Water Conservation and Efficiency Award for continued leadership in the city’s Blue Built Home program. The program certifies new homes that use an approved set of fixtures and appliances designed and third-party tested to save water and reduce utility bills by as much as 54%. The award continued a trend for Reid’s, which in 2012 was recognized as the Energy Star Builder of the Year by the Ministry of Natural Resources Canada. The first-ever national-level award of its kind given to any home builder, the award recognized leadership in a wide range of energy-efficient products, technologies and services, as well as efforts in promoting Energy Star products to consumers and businesses. Beyond the acknowledgments of its green-friendly practices was a notable nod for the ability of Reid’s Heritage Group of Companies to churn out high calibre employees. In June the company was presented the Mayor’s Award for Excellence in Workforce Training and Development, presented by the City of Cambridge to the company that exhibits a continuous learning environment and proven excellence in workforce training and development. Seeberger says Reid’s is careful to balance its drive for innovation with the needs of buyers. Through building techniques, its trades have adapted, and by paying attention to the building envelope and factors like air sealing, the company has been able to deliver high-performance homes at comparable cost to other product in their markets.